This is another very versatile recipe. It works for the whole family, and with some slight adjustments it’s perfect for kids and even as a great finger food for babies just starting out! I will start with the general recipe, and down below I will give you some tips for changing it up for the little ones. Preheat oven to 400 degrees. Mix the first 4 ingredients in a bowl to combine. Line a baking sheet with parchment paper and spread the mixture out evenly. Roast for 30 minutes. (Ovens may vary so cook until soft when poked with a fork). Remove from oven and add the mixture back to the same bowl and mix in the black beans, lime juice and honey. Scoop out desired amount onto 1/3 of your whole grain wrap, sprinkle with goat cheese, fold the ends in and roll it up! Cut in half and enjoy! 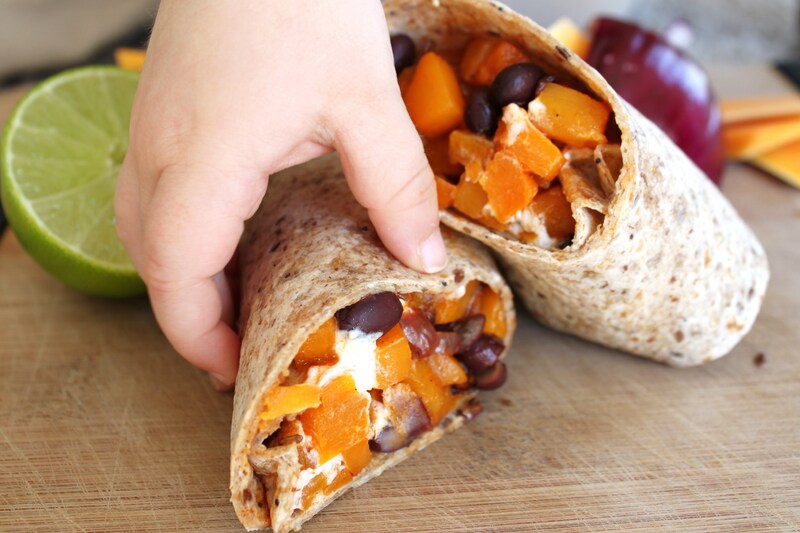 I like to make a simple batch for my little ones with only the squash and black beans. When you’re making this recipe, chop up an extra batch of the squash, drizzle with oil and roast at the same time on a separate baking sheet. Or use the plain squash and bean combo for a finger food for your baby. *Tip – make a large batch of this and store it in the fridge for a few days. It’s perfect for a quick lunch for Mama! Pull it out, throw some on a wrap and done!